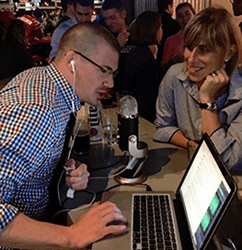 Ryan Maddrey is our first guest as we headed out to Portland Oregon for the APTA’s National Student Conclave and recorded the Ignite Talks. These are exactly 5 minutes long, with 20 slides and they all change every 15 seconds whether the speaker is ready, or not. First up in our series of five Ignite talks is #FreshPT Ryan Maddrey who talks about stress and what to do about it.